The theme for our July Wine Pairing Weekend is Summer Supper & Wine. Our pairing for the get-together is super simple, on the light side and doesn’t require the use of the oven. Quick, easy, doesn’t heat up the house are all good things in the warmth of summer. This meal comes with the added bonus of leftovers. We started this month’s pairing with the food, which evolved from another recipe I prepared for friends recently. It was delicious, but not quick and easy to prepare. To me Summer Supper must be both. You are likely to see it for an upcoming Wine Pairing Weekend, so I won’t give away that recipe now. Our wine choice this month is a result of my monthly Lodi wine calendar series on Twitter and Instagram. Each month I find a wine made in the Lodi AVA and take a photo of it with that month’s Lodi Calendar. You can find my 2017 choices by searching for #LodiCalendarWine on Twitter and Instagram. Gyro. Easy to eat, not so easy to pronounce. It is a word with several meanings and it is the meaning that determines how the word is pronounced. According to Merriam-Webster gyro refers to a gyrocompass or gyroscope. Gyro in this context is pronounced /JEYE-roh/. Gyro also means a sandwich especially of lamb and beef, tomato, onion, and yougert sauce on pita bread. This meaning of gyro is pronounced /YEE-roh/ or /ZHIHR-oh/. Now on to our recipe for lamb gyros (pleural of gyro). The recipe for yogurt dressing follows. Our version of the sandwich is prepared with ground lamb that I pressed around skewers and seasoned before grilling. Once grilled, we slip the meat off the skewers, break it into smaller portions and add it to a mixture of chopped romaine lettuce, cucumbers and tomatoes placed on a warm piece of pita bread. A few dollops of yogurt dressing finishes the presentation. 1 lb. ground lamb divided into 4 portions. Press the ground lamb around each of 4 metal skewers. Season with salt, pepper and marjoram. 1/2 cup yogurt dressing. Recipe follows. Grill lamb skewers about 4 minutes on each side or until cooked sufficiently. Allow skewers to rest for five minutes before removing the ground lamb from the skewers. Warm 4 pieces of pita flat bread according to instructions on package. I microwave them in paper towels for about 30 – 45 seconds. Place shredded lettuce, cucumber, tomatoes and grilled lamb on a warm pita bread. Add Greek yogurt to a mixing cup and add all remaining ingredients. Mix well. Allow to chill in refrigerator for 30 minutes before using. The quality of the pita bread is essential to the enjoyment of this dish. I purchase Grecian Delight Greek Pita Bread from a local Greek restaurant. Each package contains 10 flat breads which I warm it in the oven or microwave according to package directions. It has the best flavor and texture of any I have tasted. This pita bread makes a great accompaniment to hummus as well. June nearly slipped away before I remembered my June Lodi wine and calendar photo. Generally during the month I visit a Lodi winery, or the Lodi Wine & Visitor Center, to choose my wine for the month. This month I had to go to plan C. Our local market came to the rescue. We are fortunate to have an excellent, independently-owned market within walking distance of our home. It’s where we do most of our shopping. A quick study of the wines on offer revealed a wine I remembered from visiting the winery a couple of years ago. Perfect. A winery I know makes excellent wine and a vintage I have not yet tasted. Thank you Marina Marketplace! 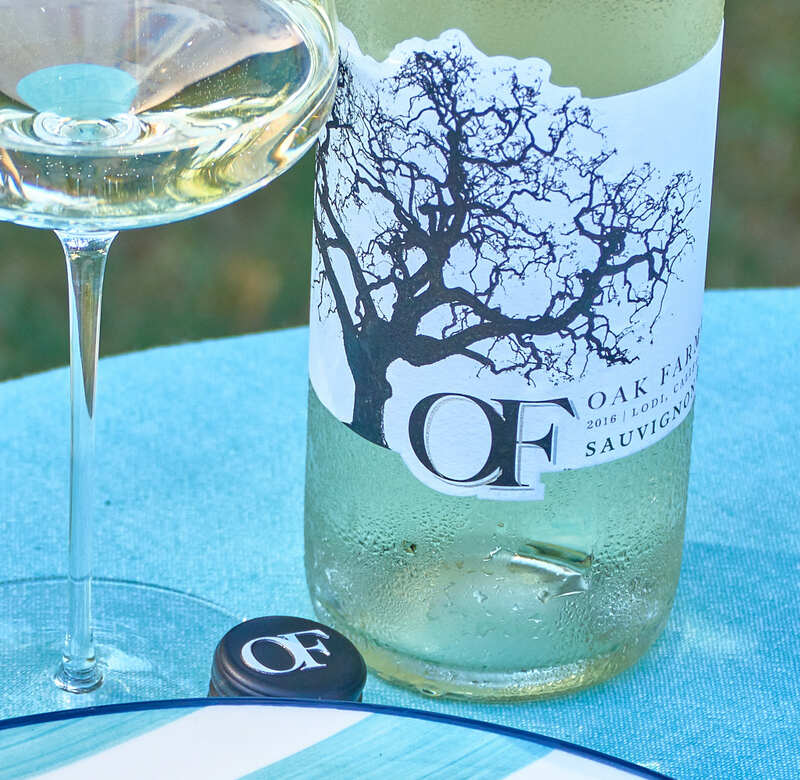 2016 Oak Farm Vineyard Sauvignon Blanc — pale yellow in the glass with generous tropical fruit aromas and hints of white flowers. Flavors are citrusy along with melon, floral and mineral backnotes. Only hints of fresh herbs are present in the background and the wine has lively acidity. 13% abv. Less than $15 at my local market. Oak Farm Vineyards is a family-owned winery located on a historic property northwest of Lodi. The Panella family has done nice job of preserving the historic buildings on the property while adding a new production and hospitality facility. We toured the new facility in 2014 when it was completed. 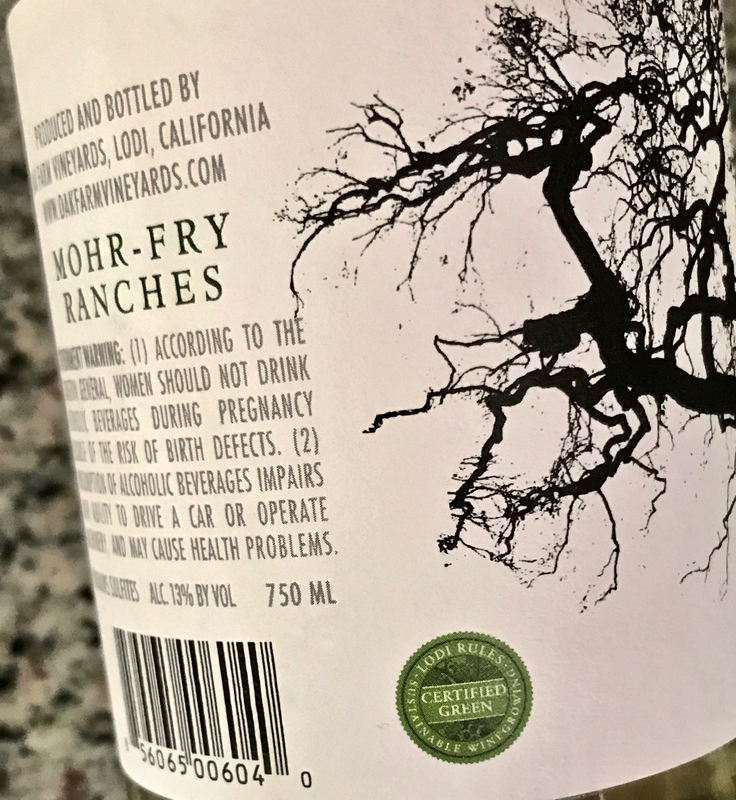 The Sauvignon Blanc for this bottling is sourced from the Mohr-Fry Ranches in Lodi. The Fry family, another local Lodi family, farm their vineyards according to Lodi RulesTM for Sustainable Winegrowning and were actively involved in the evolution of Lodi RulesTM. Lodi RulesTM is a third-party certified program defined by over 100 sustainability practices called Standards. The Standards are organized into six chapters covering environmental, social and economic issues. The sustainability program extends beyond the Lodi region. Look for the green Lodi RulesTM certification seal on wine made using certified grapes. This Sauvignon Blanc is perfect for summer sipping and summer suppers. It has bright acidity, lots of flavor and just a hint of herbaceous flavor that lets you know it’s Sauvignon Blanc. In addition to being delicious this wine is produced by a family-owned winery from grapes grown by a longtime Lodi farming family and the grapes are farmed sustainably. The price is right and I was able to purchase it at our neighborhood market. Yes, I’d say Super Sauvignon Blanc definitely applies to this lovely wine from Oak Farm Vineyards. This pairing is the perfect Summer Supper. It is fast and easy to prepare, doesn’t heat up the kitchen and it’s delicious. The Oak Farm Vineyards Sauvignon Blanc was the perfect wine with this meal. The bright acidity was a perfect counterpoint to the richness of the lamb and yogurt dressing. Gyros could just as easily be made with chicken, we like that combination too. If you don’t like lamb then use ground beef or grilled skirt steak. The yogurt dressing recipe can be varied to suit your taste as well. I sometimes make it with just dill or add dill and grated cucumber. It’s really refreshing however you make it. The rest of the Wine Pairing Weekend bloggers have come up with some interesting Summer Supper & Wine pairings as well. Please read about their pairings. On Saturday morning, July 8 at 8 am Pacific Time we will gather together on Twitter to chat about our food and wine pairings. You can join the chat by following #winePW on Twitter. We’d love to have you join the conversation. I have to say a Sauvignon Blanc is the not first thought I would have for a gyro but I can see how it would work, especially with the sauce. And it is perfect for the weather. Thanks for making me think outside the box. So true; it’s always fun to try something different. Cheers, Jade! I buy ground lamb when I find it on sale — will have to try this recipe next time! It was a fun pairing. Cheers, Gwendolyn! I have followed your blog for some time. Happy to finally meet up on #winePW, thank you for hosting too! 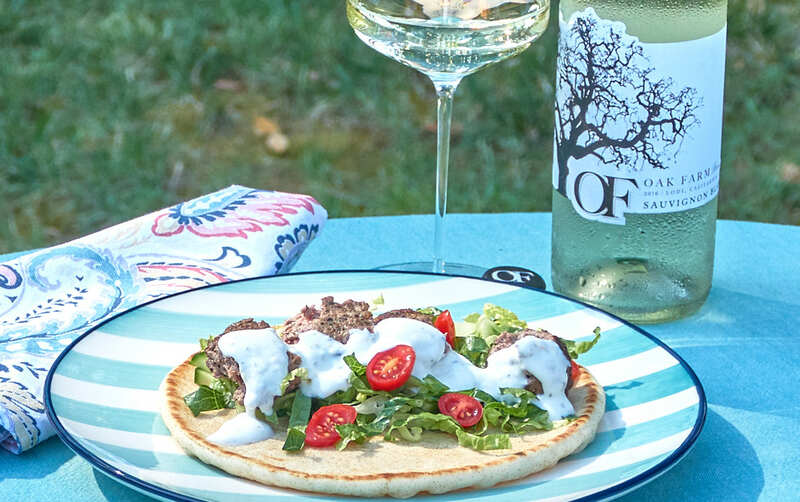 I am a fan of Greek food….and Sauvignon Blanc, I will definitely try the Lamb Gyros not sure if I can find the wine here, but a Sauvignon Blanc I will find for the pairing. Cheers! Thanks so much, Jane. I’m so happy you joined Wine Pairing Weekend…and thanks for the sangria recipe! Cheers! Thanks for hosting, Nancy. Your gyro’s look great and the wine sounds like fun! Such a nice summer meal. Sounds like a delicious pairing. Happy to be a part of the group! Thanks, Ellen. I’m happy you joined Wine Pairing Weekend. Cheers! Oh my goodness, I love this sauce! Perfect with that gorgeous Lodi wine. A knockout! What a great pairing — something I’d love to make for my family this summer. Cheers! Thanks, Jill. It’s so easy and I bet your family will love it. Cheers! I would have never thought to pair a sauvignon blanc with lamb. I, too, make my gyros with ground lamb so I am going to have to try this pairing. I know. I gave it a try because of the lettuce and cucumber. Turns out it worked very well because of the richness of the lamb too. Who knew? Cheers! I never thought of using ground lamb on the skewers – what a fantastic idea! So easy, and it looks delicious. I forget where I first saw the idea, but have been wanting to try it. It is easy. Cheers! Looks delicious Nancy. I really like lamb but have never tried it with Sauvignon Blanc. Oak Farms produces lovely wines. Thanks for the recommendation. Thanks, Michelle. Yes, we decided to break the red wine with red meat rule and it worked very well! Cheers! Sounds like a delicious recipe and wine pairing. Perfect for the theme! Thanks for hosting.